Is there anyway to get the HSF camo for the Musashi any longer or is that over with due to ending of the HSF Contract? It's over, and it's extremely unlikely to ever return. My understanding is that the anime studio that made HSF has gone bankrupt, and WG actually had to cut the HSF content early for legal reasons. Who knows where the rights to HSf will land, and whether the new owners will care about working with Wargaming? Yea, I really wanted the camouflage because of its minimalism look but didn't buy it because I didn't obtained Musashi until now. You have to get hot on Collaboration items as they've always been temporary. ARP had 2-3 events in WoWS back in the day. HSF 2. Azure Lane has had 1 so far. I got all of the ARP ships when they got passed out a while ago. I held off on the Musashi as I got the Missouri first, and then the Krondstadt and been saving my XP, now back to 1 million. Thinking about the Alaska, depending on how it turns out. I thought the HSF camo for Musashi was kind of cool but oh well. Have you watched HSF, Admiral? Just curious, that's all, lol. I liked it very much. I gotta thank this game, and the collab it did with HSF, for introducing me to the show, lel. I also recently watched the follow-up HSF OVA, and it was pretty charming too. No, I am not an anime fan. Some of it is ok but have a lot of issues with a lot of that stuff. No need to go into it though here. Just looked it up for the info to post. Not sure why i dont have Musashi camo...i have the Yamato. were they not both given out as prizes for missions at the same time?? There were missions associated with acquiring them. But it's been a year since this happened, I can't even begin to remember the details of how we got the missions nor what we had to do. The only thing I knew for certain was that to get the HSF Yamato camo, it was tied to Musashi somehow. I got the Yamato camo before I got Musashi. I don't recall what I did to get it, just that I have had it in inventory for a long time. No Yamato to put it on though. Okay, had to do some digging and this was how the camo for HSF Musashi, Yamato were attained. HSF Musashi camo was a Premium Shop purchase for $23.49 back in January 2018. 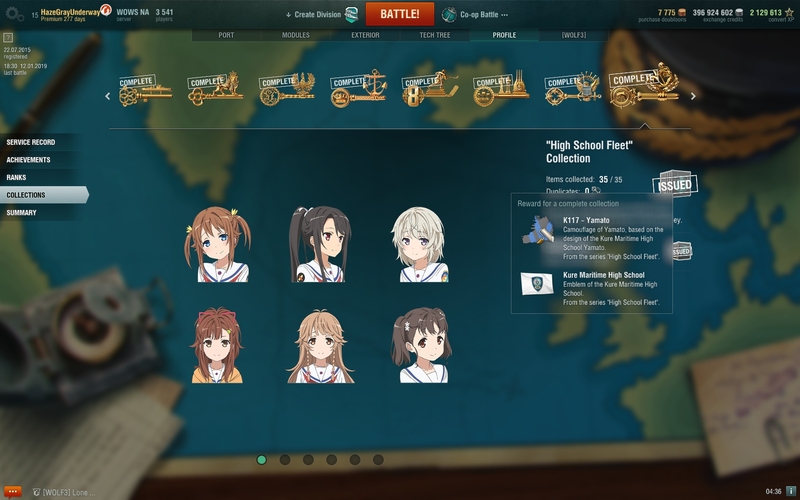 HSF Yamato camo was attained when completing the HSF Collection. I would buy the camo if it was available again. Since it took me a while before I ponied up to get the Musashi.